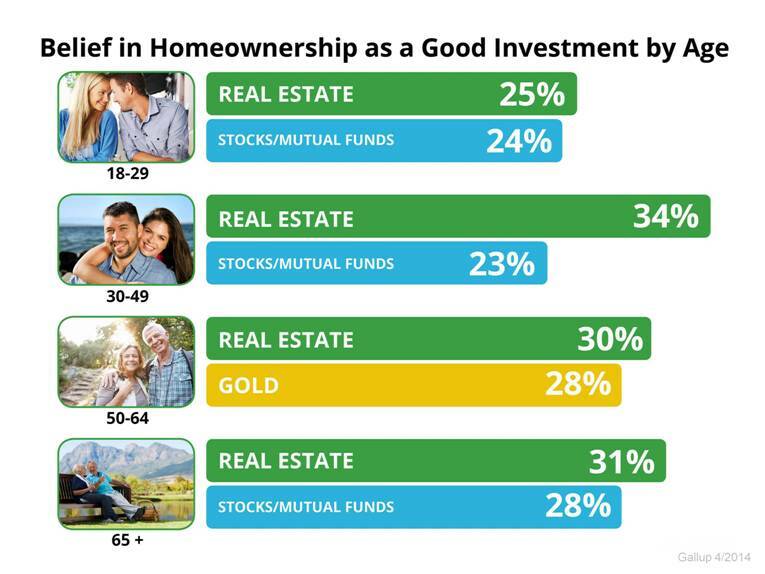 A brand new study done by Gallup shows that if you take a look at all the different types of investment, real estate ‐ according to their poll ‐ real estate still comes out as the best long‐term investment available. Here is an Infographic that illustrates the poll results. There has never been a time that real estate has been seen as a better investment, even though we’ve gone through a rough decade. A brand new study done by Gallup shows that if you take a look at all the different types of investment, according to their poll, real estate still comes out as the best long‐term investment available. Better than gold, better than stocks and mutual funds, better than putting your money in the bank, and better than bonds. What this chart shows is the two best investments broken down by age group. Instead of ranking all five, in every single age you see the number one pick and the number two pick. And in every age group, real estate is the number one pick. In every age group, whether a young 18 to 29‐year old or whether they are on in years. — sixty‐five and older — everyone in the country, no matter what the age group is, realizes how great an investment real estate is.